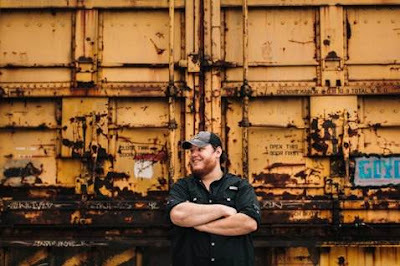 River House Artists/Columbia Nashville’s rising singer/songwriter Luke Combs, who Billboard predicts will “bring bearded everyman charm back to country”, kicks off the New Year as one of country music’s brightest new artists. The 26 year-old Asheville, NC native’s debut single “Hurricane” leads his forthcoming debut album, This One’s For You, heralded by Rolling Stone as one of “the most anticipated albums in 2017.” The anthem that showcases Combs’ signature “modern-throwback sound and grizzled vocals” (Rolling Stone) crossed into Top 40 on both Billboard and Mediabase airplay charts, reaching an impressive 29 million streams and claiming more than 146,000 digital downloads. Since entering 2017, Combs has claimed top spots on numerous “Ones To Watch” lists. iHeart Radio’s Bobby Bones, recently coined “the most powerful man in country music” by Forbes, selected Combs as the first member of his Class of 2017 -- dubbing him as a highly anticipated artist to breakthrough this year. Combs also received the coveted “Artist To Watch” nod from Billboard in the publication’s yearly preview issue joining an exclusive list of four new rising stars and proudly representing country as the sole Nashville artist. In addition, Amazon Music, CMT, Huffington Post, Nashville Lifestyles, Pandora & Rolling Stone awarded Luke their “One To Watch” title for the year. A true road warrior, Combs performed his 120th show in twelve months to a sold-out, loud & rowdy crowd for his first New York City play at the historic Mercury Lounge on Tuesday evening, Jan. 17. He will wrap this weekend with a sold-out run to Oxford, OH, Washington DC, Knoxville, Tenn. and Birmingham, Ala. Combs joins Brantley Gilbert this spring for the cross-country Devil Don’t Sleep Tour. For more on Luke Combs visit, LukeCombs.com.